Posted on 16/08/2010 at 12:03 PM. In late May I spent a long weekend with a couple of mates (Mark and Rob) down on the Eucumbene River. Unfortunately there had not been any significant rain for about three weeks and the fishing was slow with no big spawners caught. 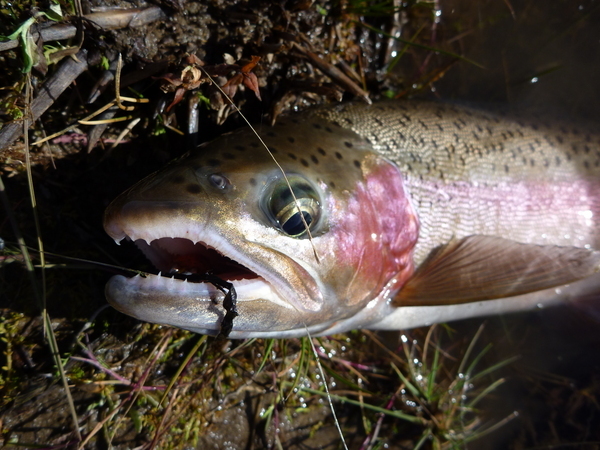 We did catch rainbows to 2lbs and even got some on the dry fly up at the Murrumbidgee as it flows into the Tantangara. A week later there was some significant rainfalls and I ducked down on my own for a days fishing. 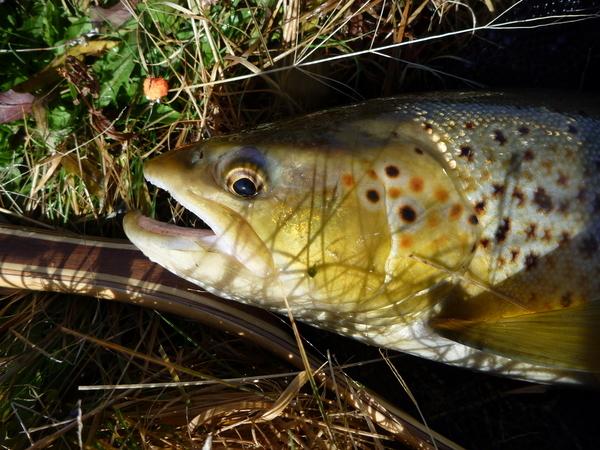 Fished downstream from Providence Portal and had a great day. Posted on 16/08/2010 at 12:17 PM. I caught about 7 or 8 fish to 3 or 4 lbs. 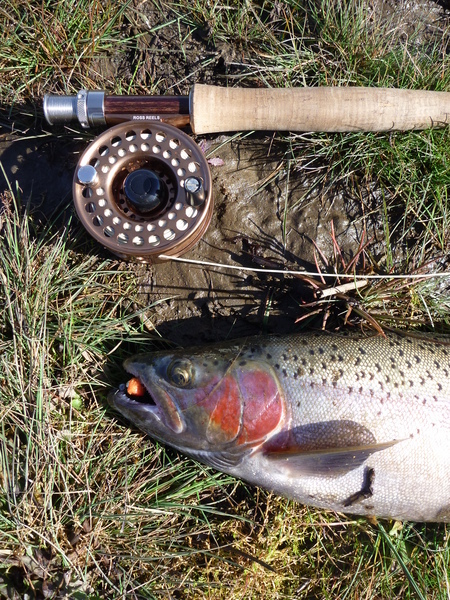 Not the huge 8 to 10 lbers you can get at this time of year - but still great fishing. Posted on 16/08/2010 at 12:47 PM. There had actually been too much rain as the river was running high and fast. It was quite scary to cross. I found one spot to wade across and was limited to one side of the river for the rest of the day. In these conditions the fish were hugging the bank. A heavy rig was needed to get down to where there were. I used a weighted glow bug with a dropper of a size 8 bead head black nymph. I also had 3 size 'BB' split shot (.4g each) attached ahead of the glow bug. Posted on 16/08/2010 at 01:09 PM. 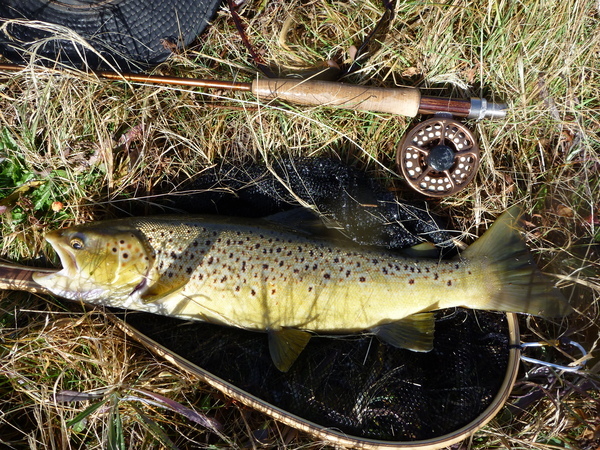 It was tough casting the heavy rig with a 4 weight (a good excuse to get myself a quality 6 weight) but I didn't have to cast far - just about 5 m upstream, close to the bank, keep the rod tip up and stay connected to the fly. Being a Tuesday it wasn't crowded. There were only 2 others there - experienced fly fishers, one from Canberra, the other from Jindabyne. I seemd to have to best success of the day. Meeting up at days end it appears I had by far the heaviest rig of the 3 of us. Getting down to the fish was paramount. PS : Sorry for submitting this so late. I've had trouble with uploading the photos. Posted on 16/08/2010 at 02:10 PM. Posted on 16/08/2010 at 03:32 PM. Posted on 16/08/2010 at 06:32 PM. PS : Sorry for submitting this so late. Posted on 16/08/2010 at 07:52 PM.